Outstanding Crochet: Healthy living. My way of making home-made Greek yogurt in the multi-cooker. Healthy living. My way of making home-made Greek yogurt in the multi-cooker. This is an unusual post for my blog and I am labeling it "Healthy living". I am trying to eliminate as many chemicals from my life as I can. I already ditched many things, like anti-perspirants, commercial shampoos, perfumes, full of phthalates and parabens. I am sick of that waterfall of chemicals they dump on us without warning! I would like to spread a word, so more people stop buying that crap and we get more healthy choices in the stores! Sorry for the strong words! Today I want to talk about yogurt. In that article you'll find 10 toxic foods that are banned in some countries, but in USA. So I started to make my own and you don't need a yogurt maker for that. I think those are just useless for Greek yogurt, they are too small. I searched quite a bit and did not find a suitable one for me. Besides, almost all of them are made out of plastic! 7 cups x $3.03 = $21.2 would cost me at the grocery store. $21.2 - $5.99 (cost of milk) = $ 15.21 in savings. Besides, yogurt you'd make has much more bacteria because it's fresh. They say there is almost no bacteria in 1 month old yogurt. So if you don't have one, and if you like me, want to throw everything in and forget about it and get a meal in 30 minutes, you need this thing! If you have a Dutch oven, you can use that one too, though I don't have any experience with them. Google "home made yogurt in Dutch oven". There are multi-cookers out there with "yogurt" mode, I think it's my next purchase. I guess it would make the process faster. 2. Organic milk - 1 gallon. I use 2% milk. Whole milk produces the same amount, but kind off thicker and more delicious yogurt. It's your choice. 3. 1 cup store bought organic yogurt for a starter (you won't need it every time, just once in a while) I buy Greek Stonyfield. 6. Big bowl to put a strainer on, so you have room in the bowl for whey to strain from yogurt. 1. Pour a bit of water in the cooker, turn it on on "pressure" mode for 10 minutes (to get rid of possible bad bacteria in the pot). Empty the pot. 2. Pour milk in a cooker, turn on "warm" setting for 10 minutes. Check that milk is warm, it should be 110 - 115 F (43-46 C). I don't have a thermometer and I just check if it's warm. 3. Turn the cooker off, close the lid, leave it for 24 - 36 hours. It's winter now and it's about 60 F in the house, so I leave it for 36 hours. In summer 24 hours will be more than enough, I guess. It's all practice. 4. Cover a strainer with cheese cloth, put it on top of big bowl so you have room for whey. 5. Pour yogurt in the strainer (I usually keep about 4 cups for the next time as a starter), leave it in the fridge over nigh. Enjoy your Greek yogurt in the morning! I use whey for making pancakes or they say it's a very healthy protein beverage. I buy new yogurt as a starter about every 4th time, but you can do it every time. You also can buy a dry starter for yogurt, but they are expensive. You can add fruits in the yogurt right before eating. You can use it to make salad dressings. I add it to soups. It taste so good, you will never go back to store bought yogurts, believe me! Good luck and be healthy, my friends! yogurt is not greek food. yogurt is traditional turkish food. but everybody knows greek food. Yoğurt çok sağlıklıdır ama Türkler'e aittir. Natalia, this yogurt looks great, so thick and yummy !! Natalia, I make cottage cheese (творог) the same way in my Instant Pot, which has Yogurt setting. After the yogurt is ready I turn on the Keep Warm setting for two hours and after that let it completely cool. Then I strain it in cheese cloth. 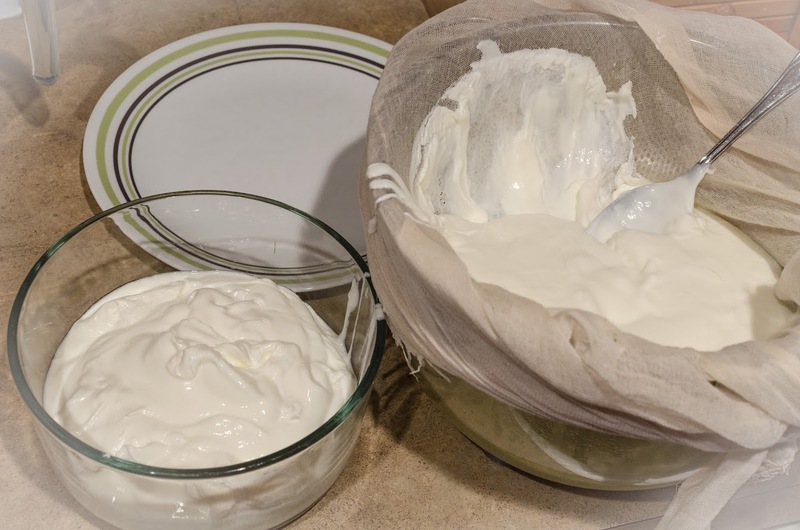 Have you tried making your own cottage cheese at home? Well, the "Keep Warm" setting work by 65*C? the yogurt is being kept for about 2 hours at that T. Do you think all bacteria are dead by then? I hope not))) As to the Instant Pot, now they have the newest model Instant Pot Smart, which has some additional functions like different T for "Keep Warm" setting and you can even cook sous vide. Isn't that cool? No, I meant if you make cottage cheese, you kill all bacteria in heating process. Yogurt making setting is of course fine. All right, well, we cleared this issue now ))) May I ask you one more question? Do you by any chance bake your own bread at home considering your interest in healthy living? :))) yes, I do make bread in bread making machine though. Do you?